Rising on the former site of Cunard’s Pier 54, Thomas Heatherwick’s park over the Hudson River is now blooming quickly. Pier 55 continues to be assembled piece by piece on the Chelsea waterfront. Large, preformed concrete blocks are being placed into position with the help of barges and the use of a construction crane. The 2.7 acre grounds will sit atop 425 piles that hold the project over the water, giving the structure its unique shape and figure. Hudson River Park Trust (HRPT) will manage Pier 55, and Mathews Nielsen Landscape Architects, P.C. is designing landscaping. Today, YIMBY has a look at new photos of the model for the site, which offer a much better illustration of the park’s impending appearance. 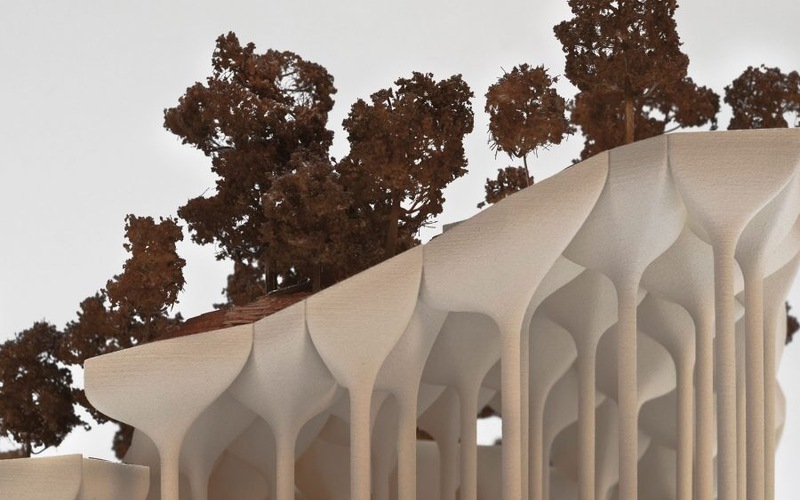 The piles will support large, funnel-shaped, concrete blocks that have been sculpted with rounded corners and undersides. These will come together to create the platform for large open lawns, stepped terraces, abundant landscaping, and green hills. The range in elevations are due to the different heights of the support structures below. The highest part of Pier 55 will be in the western corner, accessible by a sloped and winding path while the lowest point is found along the southern side. Looking at the model photos above, two entryways will connect Pier 55 to Hudson River Park. The northern walkway will allow visitors to enter the park first and stroll around a large, flat open space. The southern footpath will be accessed by walking underneath the old steel frame of Cunard’s former Pier 54 facade. 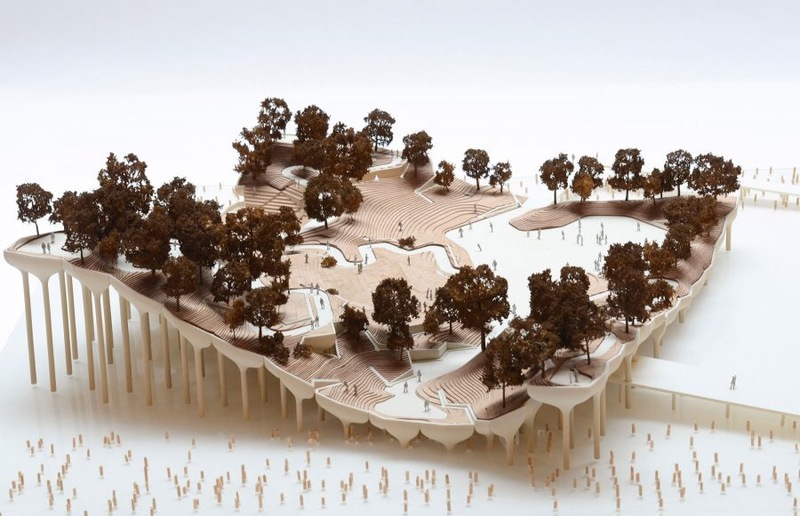 From there, guests will enter from underneath the esplanade and its architectural concrete piers, emerging among a steep valley of trees and landscaping. Recently, construction has been slowed down due to the cold temperatures and extreme weather patterns but will fully resume in the spring. Once all the concrete caps are in place, landscaping and tree planting should soon follow. Completion of Pier 55 is expected sometime in 2020. 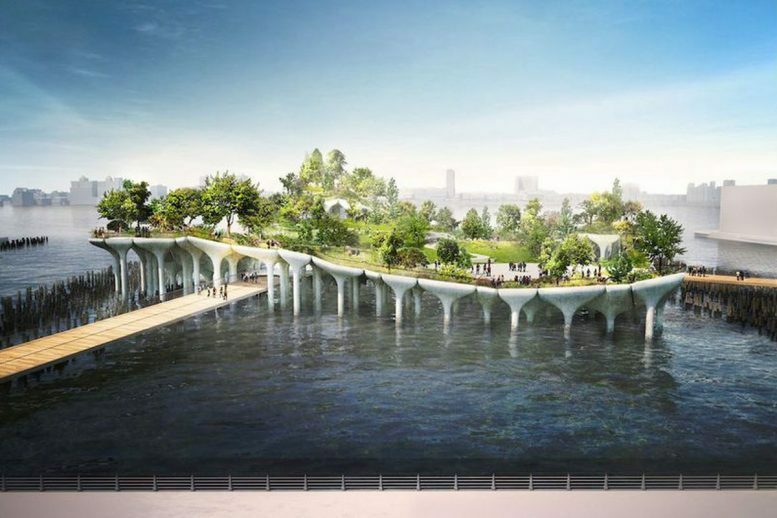 12 Comments on "Model Photos Revealed as Thomas Heatherwick’s Pier 55 Begins to Bloom Atop the Hudson River, in Chelsea"
One of the best things about YIMBY is reading the fortune cookie comments. Please pardon my using of your space: a sculpted landscapes the evokes the the contours of the valley! One thing the artist’s impressions don’t show is the connection between pile and “funnel.” Photos of the completed piles don’t show any rebar emerging from the top of them as one one would normally expect to see. The design of the connections is crucially important structurally but all we’ve seen so far are “cosmetized” impressions which just show one component flowing smoothly into another with nary a hint of a joint. For this elaborate confection to be impressive, the concrete (supposedly all white) also has to be immaculate. And apparently, each of the funnels is geometrically unique. Perhaps these aspects explain in part at least, why the initial cost projection of $35m has jumped by a factor of at least eight. With luck and a fair wind, it could look spectacular when finished but I can’t help but wonder how it will appear after two years of sitting in what is essentially a salt-water marine environment. In the 80s, the Westway highway could not be built on pilings sunk into the river because of environmental issues. This makes me wonder how and why this ego-driven future white elephant was permitted to go forward. Pier 55 is a total of 3 acres above 425 piles allowing the Hudson River to continue to flow. Westway was proposed as 234 acres of Hudson River landfill from 42nd Street to the Battery. You’re comparing these two projects as equal? Erasing Cunard then Cunard White Star Line Pier 54, leaving just a steel arch, takes with it the location where all the Titanic’s survivors arrived aboard the Carpathia in April 1912, where the Lusitania sailed from in May 1915 to then be torpedoed off Ireland, where hundreds of thousands of immigrants landed, and troopships departed and arrived back carrying those fighting in two World Wars.